With this year’s Mobile World Congress less than a month away we’ve been treated to another teasing glimpse at of a pair of Samsung’s flagship handsets for 2016 – the Galaxy S7 Edge and Galaxy S7 Plus. As with the last leak we shared of Samsung’s next premium smartphone range this one comes courtesy of a mobile case store online. This time its retailer MobileFun.co.uk who, by listing new products from Rearth, have shared a generous look at the new variant models which features a 5.1” display, curved at both the edges on the Galaxy S7 Edge, and a sizeable 6” display on the Galaxy S7 Plus. 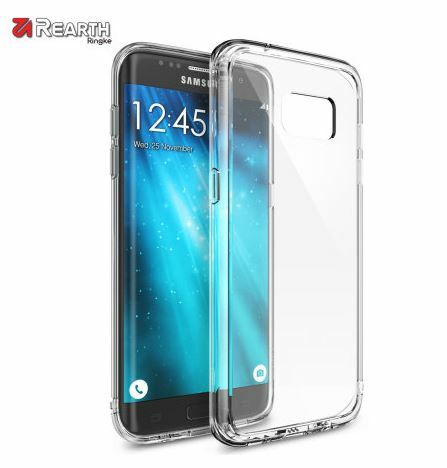 As the Ringke Fusion Case features a design that “emphasises the back of the Samsung Galaxy S7 Edge” and is made of a crystal clear plastic we’re able to get a really good look at both the front and back of the handset (or at least a very official looking render of it) and as expected nothing much has changed since last season’s S6 Edge in terms of design. The polycarbonate and rubber case designs do for both models do give us a look at where all the ports and buttons will be located around the handsets and camera and flash position doesn’t appear to have changed at all since the previous models. The leaked pics do confirm that the handsets will be available in at least a white and a black versions – this is visible through the slip-on case. With no real alterations to appearances we hoped to be dazzled by the Samsung Galaxy S7 range when official specifications are released, likely at the Mobile World Congress before Apple can start tempting the mobile buying public with its 2016 line-up of iPhones.